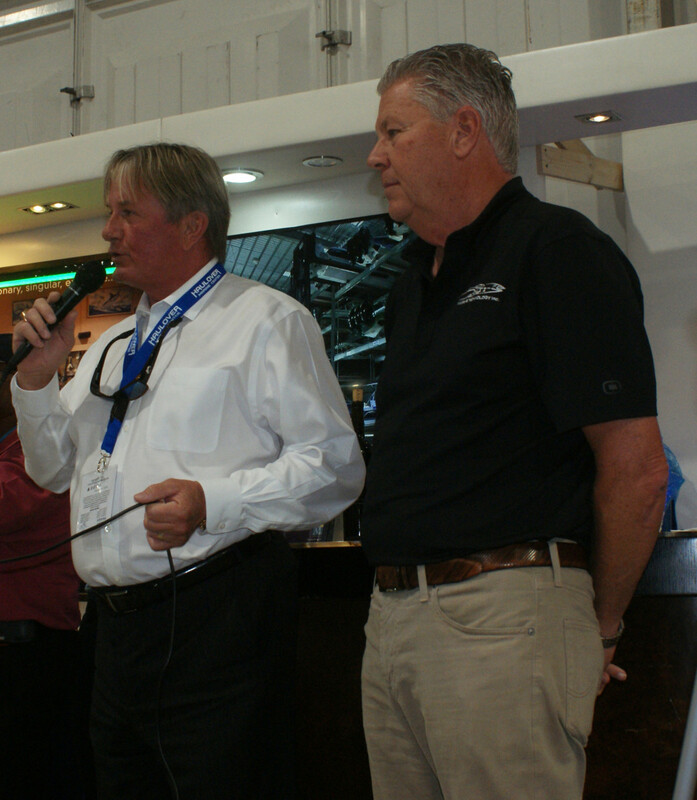 Westrec’s John Louis (left) and MTI president Randy Scism announce their partnership. Marine Technologies Inc., a manufacturer of custom high-performance catamarans and center consoles is opening a sales and service location at Haulover Marine Center in Miami Beach, Fla.
“They have the ultimate facility,” Randy Scism, MTI president, told Trade Only Today during the Westrec press conference at the Fort Lauderdale International Boat Show. “Their storage building is the only one I’ve seen built to withstand a Category 5 hurricane and their fork lifts can pick up our 57-foot center console.” MTI sales manager Tim Gallagher will be based out of Westrec’s Haulover location. Westrec provides an update about the marinas it manages each year at FLIBS. Also in Florida, Westrec’s Hall of Fame Marina in Fort Lauderdale will be undergoing expansion to accommodate larger yachts. Scott Salomon, marina manager, said the facility will be adding concrete floating docks that will create space for five megayachts up to 160 feet long. Salomon said the marina’s north docks will remain open during the upgrade. The new docks will be built by Bellingham Marine and the expansion is expected to be complete in Fall of 2019. Westrec manages 11 facilities with more than 7,000 slips in Chicago and those facilities will be undergoing a dock replacement process with up to 3,000 slips being upgraded over the next decade. “Our challenge is to design slips and facilities for future boaters,” said Scott Stevenson, executive vice president at Westrec who oversees the Chicago region.